Battery Bill's for half price!!! 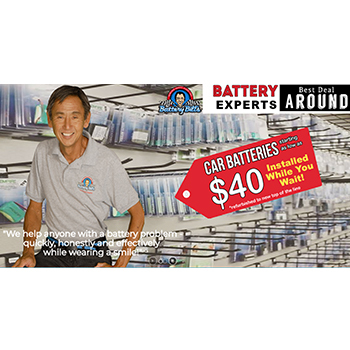 • Battery Bill's mission is to help anyone with a battery problem – quickly, honestly and effectively while wearing a smile! 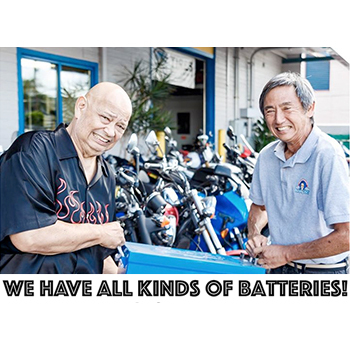 • Batteries are stocked locally at our two (2) Convenient Locations: 550 N. Nimitz Hwy & 960 Ahua St in Mapunapuna. We offer the best value in town. Ask about Delivery! • WHAT ARE BATTERY REPORT CARDS? As a battery is shipped and stored, it loses its charge. Other places do not monitor the batteries once they receive them, so they are sold already depleted. Battery Bill’s monitors and tests every battery and makes sure you get a fully charged battery. • OUR BATTERIES LAST LONGER - Did you know our humid climate shortens the life of your batteries? Battery Bill searched the world to find batteries suitable to Hawaii’s warmer climate so they will outlast any other standard battery. • WE RECYCLE! Battery Bill is committed to recycling spent batteries as a means to reduce waste in our landfills, stop harmful chemicals from contaminating our soil and water, and preserve our environment by decreasing the need for new raw materials from the Earth. When you shop at Battery Bills we will recycle your old batteries. No cash value. No cash back.